This mill is situated on the main A69 Carlisle to Newcastle road about six miles east of Carlisle. The mill generally goes by the name of Little Corby Mill. There has been a mill in Little Corby since at least the mid 12th century. Robert de Vallibus, lord of the barony of Gilsland, gave Little Corby and Fenton to Alexander de Windsor, including the mill and fishery. He then gave part of the profits of the mill at Little Corby to Lanercost Abbey. Part control of the mill passed to Hugh de Salkeld of Corby Castle. Full control of the mill was eventually achieved by the Howards of Corby Castle. The mill was rebuilt in 1802 for £750, the present structure dates to a rebuild of 1839. 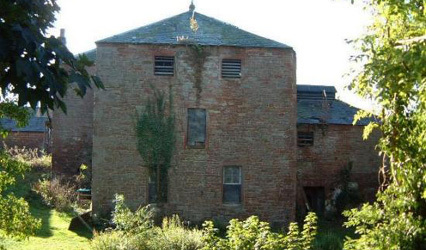 The mill was sold off in the 1880s to Mr W.J.Thompson of Warwick Bridge. It finally closed in 1989 when the last miller retired, and has been slowly deteriorating since. The mill is powered from a weir at the junction of the Troutbeck and Cairnbeck, and a long race leads to the mill. The main block of the corn mill has a square plan of three storeys with a slate pyramidal roof. On the downstream side a kiln is attached. This is two storeys with a high-hipped slate roof and a substantial long cowl on the ridge abutting the mill. The block to the south of the mill houses the water wheel, and at the south end a cart shed. An extension has been built against this to provide storage accommodation. Another extension has been added on the millstream side of the building to provide an extra room at all levels. All of the mill buildings are in the local red sandstone. All window openings have rotating wooden louvre windows. The millrace enters via a trash rack and flows to the hatches that control the water to be discharged onto the wheel 4ft above the centre of the shaft (high breast shot wheel). The water wheel shaft is 10-inch diameter cast iron with rectangular ribs running along it to increase its strength. Three circular hibs are fitted outside rhe rectangular ribs of the shaft. From each hub T-shaped sectioned spokes support the rims and buckets. Thirty-two sheet iron buckets surround the wheel, which is 10 feet wide and 14 feet in diameter. The main drive shaft enters the mill at floor level in the basement of the main mill block. The first gear wheel (pit wheel) is a one piece casting nine feet in diameter. The rim on eight T-section spokes carries 112 teeth. The drive turns from horizontal to vertical by means of the wallower cast iron bevel wheel five feet diameter with 54 teeth. The lowest gear on the upright shaft is the great spur wheel; this is nine feet in diameter and has 136 wooden teeth on both the rim and the face. The great spur wheel drives five stone nuts, which are iron wheels 18 inches in diameter. These are carried on tentering bridges with keyways holding them in place on the iron stone spindles. The stone nuts are lifted out of engagement with claws carried on hinged arms. The hurst frame is made of heavy timber reinforced with rolled steel posts on the main face. Between the stone nuts are five meal chutes, which are square tubes with shoes on the end to allow two sacks to be filled at once by swinging them over. The main drive shaft ends in a bearing below the stone floor. There are five pairs of stones around a secondary upright shaft which passes up to roof level and drives various auxiliary machinery. Two pairs of stones are Lazonby stones used for shelling barley and oats for animal feed. The other three pairs are French stones for flour. Each pair is contained in its own tun. They are fitted with bell alarms which sound when no corn is pressing onto leather straps.